The forward thinking Danish watch company, Kanske is about to launch its exciting new range of watches which mixes ultimate quality with simplicity likened to the Occam’s Razor theory. – Kanske is more than just a watch manufacturer. Time and care is taken over every component of its watches, including their design and the message given across in the design. The newest range from the cool Copenhagen brand is entitled ‘Occam’s Razor’ as it relates to the medieval Occam’s Razor theory which states that the simplest route to a solution is usually the most fruitful. To mirror this, the Occam’s Razor watch is minimalist in its design whilst maintaining a beautiful quality which hints at the craftsmanship behind its existence. Each watch in Kanske’s new range operates using a Swiss Ronda 5030.D premium quartz movement and is powered using a three eye chronograph. Both of these features ensure that the watches are accurate and powerful, unequivocal, which mirrors the very belief behind their design. In addition to the watches’ mechanisms, their aesthetics are timeless and beautiful, with Italian calves leather straps. The face of an Occam’s Razor, although simple, is contemporary with splashes of colour on the dial and hand, all set against a chic black backdrop. 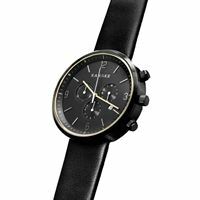 Kanske prides itself on the quality of its Danish watches. 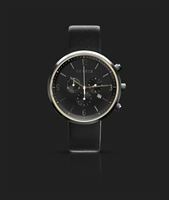 Every design is generated from a series of thoughts and ideals, which give a purpose to the watch. The very name ‘Kanske’ is an old Scandinavian word which is actually a contraction of words meaning ‘maybe’ or ‘might happen.’ The company wants every one of its customers to feel that in buying a Kanske watch, they are opening the door to endless possibilities. The new range of ‘Occam’s Razor watches,’ opens the wearer up to true ethereal quality, uncompromised by uncertainty and façade. Kanske jewellery is co-founded by Arne Leivsgard and Dann Thorleifsson. Not only do they both have experience in designing and selling watches, but they also have a clear vision which sets the company apart from its rivals. It is clear that every new piece they create has been done so with passion and originality so that customers are getting an experience, not just a new timepiece.